Spring is around the corner and we’ve scored some outstanding discounts for our cherished guests on bookings made this month. These hand picked Florence apartments are all of the finest quality. Discounts of up to 20% if you confirm by April 1, 2018 for stays any time during 2018! Valid on new bookings from March 11, 2018. Cannot be backdated for existing reservations. Diana – Enjoy living in a true Italian palace and strolling to all the sights in this city treasured for its art. 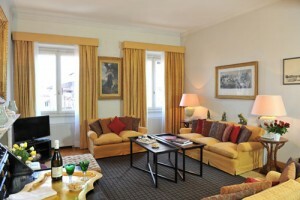 Nido – A charming studio nestled in the heart of Florence. Rondine – Sunny studio loft near Santa Maria Novella. Falco – A warm and cozy feeling apartment in a fine palazzo. A special feature is a private terrace with a view of Florentine rooftops. Torella – This amazingly sun filled apartment with terrace is at the top of a Renaissance palazzo that faces the Uffizi gallery. 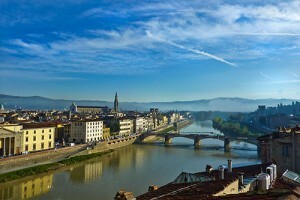 Artemesia – A gracious luxury apartment in the finest part of central Florence with all amenities and a very nice view. 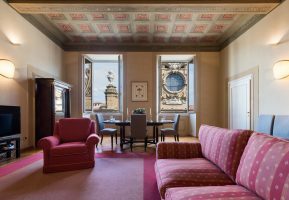 Beatrice – This elegant apartment can be a highlight of your stay in Florence. It overlooks a wonderful Baroque church that adds an unforgettable historical touch to your stay. 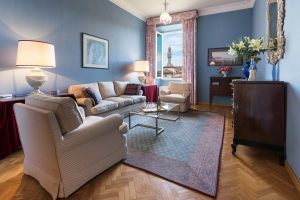 Sandra – This apartment is especially large and luminous with comfortable and gracious living room with a view of the Duomo. Caterina – Spacious and gracious, this apartment is right in the heart of Florence. Rallo – A roomy and bright two bedroom apartment in the center of Florence, ideally suited for two couples or families. Merlo – Spacious, rambling two bedroom apartment plus loft apartment in center of Florence. Caravella – A bright and charming home overlooking the monuments of Florence and the Arno River. Giovanna – A terrace is a lovely amenity in this recently renovated and roomy apartment. Look at the photos! Vela – A large and bright apartment with lovely views of the Arno river and the storied galleries of the Uffizi. You’ll love these Florence apartments, which include an array of private concierge services to book tours, arrange a private chef or set up a Tuscany wine tour. Contact [email protected] to book your stay! Or call 1-888-308-6123.